Luxury, contemporary, elegant. 3 words that describe Rush's new flagship salon perfectly. 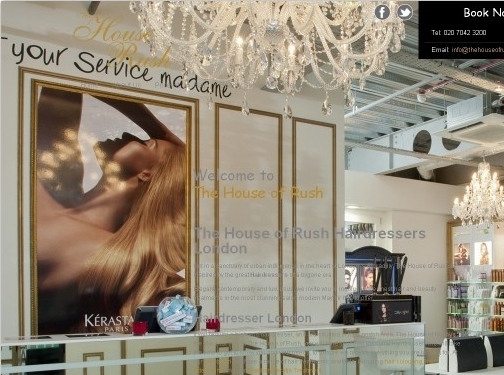 At The House of Rush we invite you to indulge yoruself in some of the finest hair and beauty treatments in our most stunning salon in Mayfair. We offer mens treatments as well as private rooms for a more discreet experience and the gorgeious Brazilian blowdry is also available. Come and speak to one of our consultants or book an appointment today and see what offers we have available. UK (London) based company - offering hair and beauty salon services. Website includes details of their services, pricing, news section, full company contact details.